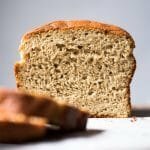 Count on this paleo and keto bread to be soft, fluffy, absolutely delicious and with a killer crumb. Plus, with less than half the amount of eggs as your usual low carb bread recipe, this non-eggy sandwich bread will surely become a staple! Without a doubt the most requested recipe by you guys this year has been for a light and not-eggy keto bread loaf. And after quite a few takes, we finally nailed it. The resulting bread has awesome rise (nearly double it’s initial volume!! ), killer crumb, and excellent taste. And as previously mentioned, it’s not eggy, dense or crumbly. Think at least less than half the amount of eggs of your typical recipe, and a few other tips and tricks to ensure killer results. So while different from traditional wheat bread (because ahem, no wheat! ), we’re still certain you’ll find this a keeper. Plus, it keeps very well at room temp for 4 days and freezes beautifully. Oh, and you might also be surprised how good this bread is even without toasting. 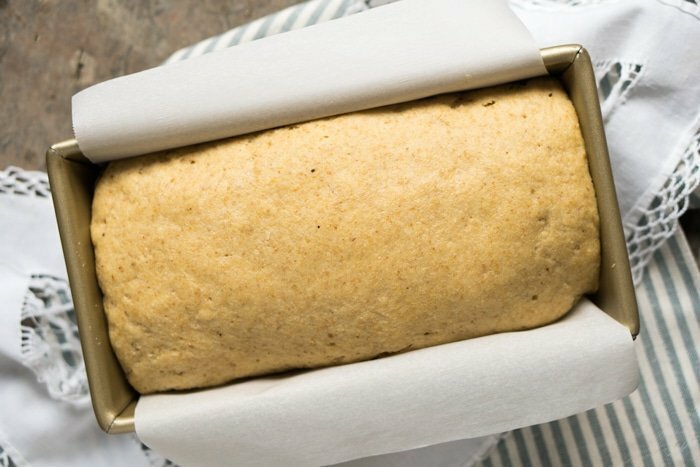 Making this paleo and keto bread is incredibly simple really. But, like with any yeasted bread, it does require you take care of a few details to ensure the best possible outcome. And the one thing to keep in mind is that your bread will likely fall slightly post bake. Blame it on the lack of starch (keto flours are notoriously heavy and moist) and certain missing proteins (think gluten). Just keep in mind that we’re baking at ridiculously high altitude here, so if our loaf was still nearly double it’s volume after cooling- odds are yours will be even better! The yeast in this low carb and keto bread ensures a wonderful texture and taste. Now, how much your bread will rise (and fall!) post-bake depends quite a bit on your altitude. But note that you still won’t get that gummy and wet texture here of most low carb breads. Plus, as mentioned, we’re baking at over 7,000 feet (Mexico City here!! ), so if we can make this keto sandwich bread work so can you. Weigh your ingredients. This will forever be a staple recommendation for any sort of gluten free baking here at gnom-gnom. As aside from leading to less dirty dishes, it will ensure consistent results time and time again. Remember that gluten free (and particularly keto) baking is notoriously finicky, and measuring by cups is anything but accurate. And if you don’t own a baking scale, measure with cups by dropping the ingredients onto them rather than scooping them out (which often leads to overpacking). Ingredients at room temperature. Self explanatory really, but incredibly important (particularly for the eggs). If you add cold eggs to the mix your bread simply won’t rise much (if at all). Proof the yeast. This involves mixing dry active yeast with water that’s just warm to touch (between 105-110°F to be precise) and maple syrup or honey for 7 minutes until foamy. And before you scream sugar (!!) remember that the yeast will feed on such sugar to emit carbon dioxide, so it doesn’t affect the carb count at all. And yes, this is a scientific fact. Avoid abrupt temperature changes and air drafts. Like with any yeast bread, you need to cuddle your dough. Make sure it’s able to rest undisturbed in a warm space. Baking at high altitude? Yup, so am I (Paola here!!). I’ve tried quite a few combinations, and the one modification I will suggest is to increase your oven temperature by 25°F. You may also need to decrease the baking time by 5 minutes (I baked the bread for 45 mins), but that may change from oven to oven. 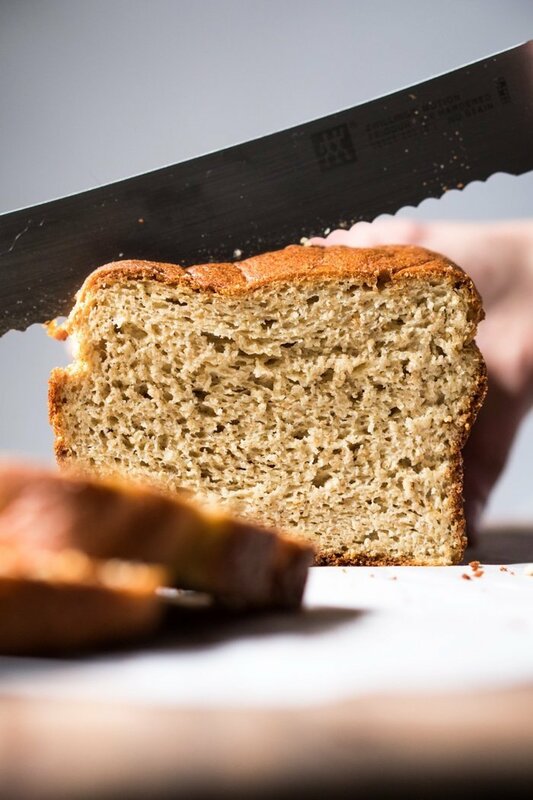 This bread does have quite a few ingredients, but you’ll find that most are staple paleo and keto pantry ingredients. In the list below you’ll find details on several ingredients and possible subs. But if possible, please do try and make this recipe without any subs. As out of the 18 permutations we tried, this one really was terrific and the absolute best. Almond flour. You truly need a super finely ground almond flour here, as if you use meal your bread will turn out dense and oily. Super fine almond flour brands include Anthony’s , WellBees and Bob’s. 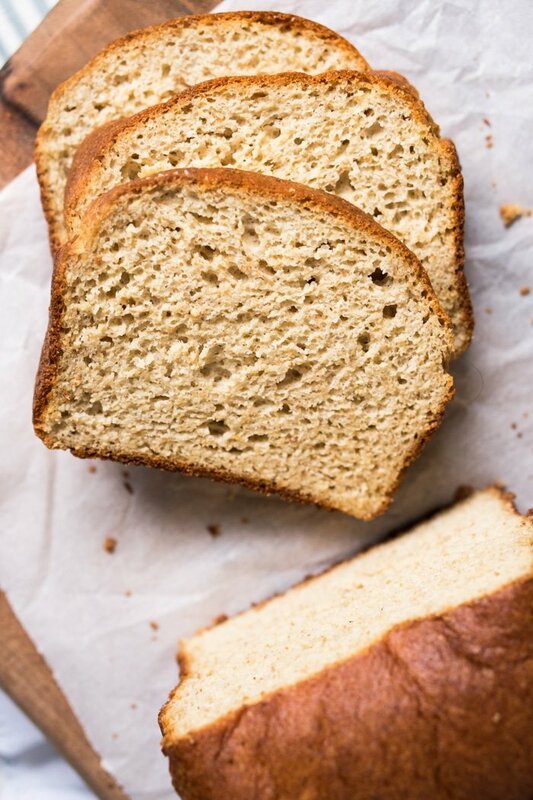 Now if paleo, or in keto maintenance, you can lighten up the bread even more by substituting part of the almond flour (1/4-1/2 cup) with arrowroot flour. Flaxseed meal. You’ll want to use golden flaxseed meal (we use Bob’s), and regrind the flakes in your (very dry!) bullet or blender until finely powdered. Great way to avoid slimy bread. You can technically substitute the flaxseed meal with psyllium husk powder, but we prefer the crumb much more with the flax. Psyllium husk powder. Same as with your flaxseed meal, you’ll always want to regrind your psyllium husk. We always favor NOW brand as it doesn’t turn bread purple. You can substitute it with more flax, but your bread may lose some elasticity and rise. Whey protein isolate. This one is an absolute must, as it will ensure your bread doesn’t collapse post-bake. Keep in mind that this ingredient varies tremendously from brand to brand, and we’ve only tried (and are super happy!) with Isopure’s Zero Carb Unflavored. Now, the cream of tartar and powdered ginger help to condition the dough to get an even nicer rise. Though note that you can skip them without too much detriment to the final results. We’re working on a unique video for the keto bread, but in the meantime the focaccia methodology is exactly the same (plus some added ingredients) so it’ll help you get a good idea. Oh, and if baking with cups rather than grams is your thing, just click on US Cups for an instant conversion. Though for best results we (highly!!) suggest you weight your ingredients here. See recipe video for guidance on keto yeast breads. And check out the post for deets, tips and possible subs! Line a 8.5 x 4.5 inch loaf pan with parchment paper (an absolute must!). Set aside. Add yeast and maple syrup (to feed the yeast, see notes) to a large bowl. Heat up water to 105-110°F, and if you don't have a thermometer it should only feel lightly warm to touch. Pour water over yeast mixture, cover bowl with a kitchen towel and allow to rest for 7 minutes. The mixture should be bubbly, if it isn't start again (too cold water won't activate the yeast and too hot will kill it). Mix your flours while the yeast is proofing. Add almond flour, flaxseed meal, whey protein powder, psyllium husk, xanthan gum, baking powder, salt, cream of tartar and ginger to a medium bowl and whisk until thoroughly mixed. Set aside. Once your yeast is proofed, add in the egg, egg whites, lightly cooled melted butter (you don't want to scramble the eggs or kill the yeast!) and vinegar. Mix with an electric mixer for a couple minutes until light and frothy. Add the flour mixture in two batches, alternating with the sour cream, and mixing until thoroughly incorporated. You want to mix thoroughly and quickly to activate the xanthan gum, though the dough will become thick as the flours absorb the moisture. Transfer bread dough to prepared loaf pan, using a wet spatula to even out the top. Cover with a kitchen towel and place in a warm draft-free space for 50-60 minutes until the dough has risen just past the top of the loaf pan. How long it takes depends on your altitude, temperature and humidity- so keep an eye out for it every 15 minutes or so. And keep in mind that if you use a larger loaf pan it won't rise past the top. Preheat oven to 350°F/180°C while the dough is proofing. And if you're baking at high altitude, you'll want to bake it at 375°F/190°C. Place the loaf pan over a baking tray and transfer gently into the oven. Bake for 45-55 minutes until deep golden, covering with a lose foil dome at minute 10-15 (just as it begins to brown). Just be sure that the foil isn't resting directly on the bread. Allow the bread to rest in the loaf pan for 5 minutes and transfer it to a cooling rack. 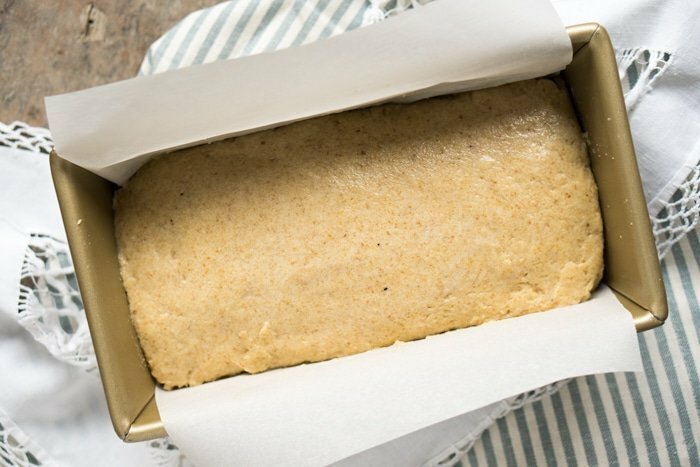 Allow to cool completely for best texture- this is an absolute must, as your keto loaf will continue to cook while cooling! Also keep in mind that some slight deflating is normal, don't sweat it! Keep stored in an airtight container (or tightly wrapped in cling film) at room temperature for 4-5 days, giving it a light toast before serving. 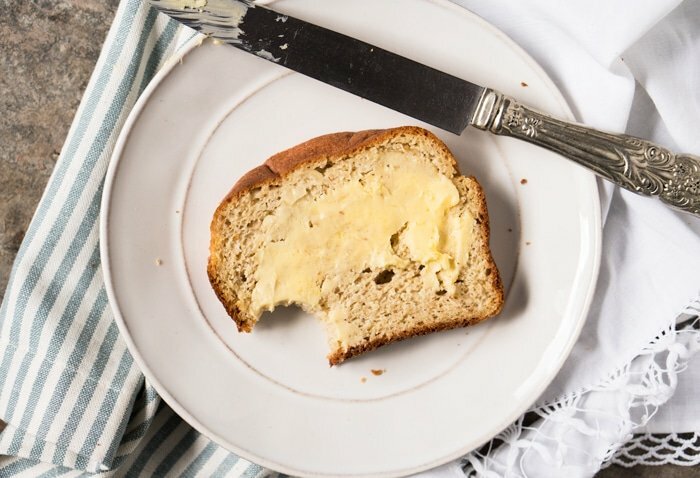 Though you'll find that this keto bread is surprisingly good even without toasting! *Sorry for the caps, but before you scream sugar (got 5 emails about it right after posting!!) remember that the yeast will feed on such sugar to emit carbon dioxide, so it doesn’t affect the carb count at all. And yes, this is a scientific fact. **If paleo (or in keto maintenance), feel free to sub 1/4 to 1/2 cup of almond flour with arrowroot flour for a lighter crumb. Please note that nutrition facts were estimated per slice, and we found the recipe to yield 12 generous slices. Though you could easily get 16-18 thinner slices. If you made this recipe (or got a question! ), be sure to simply comment below! Is this bread dry tasting? I am desperately searching for a bread that isn’t too dry and Keto approved. Hi Kelly! 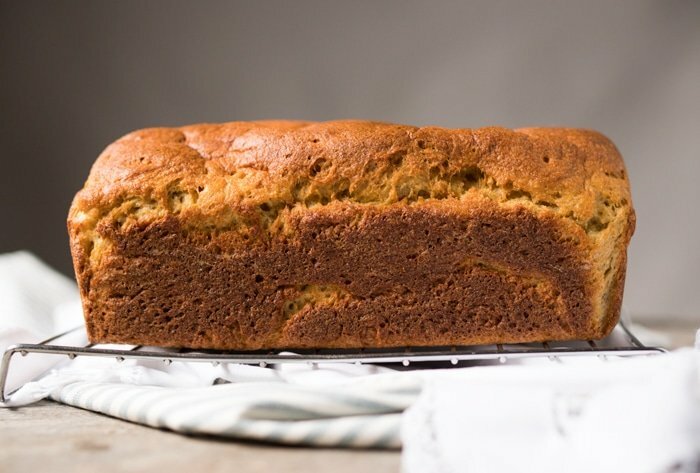 I’ve got a better one for you, search the blog for banana bread and you’ll get one of our highest rarest recipes (using the extract it really does doll everyone!) xo and welcome to keto! Can I use collagen powder instead of whey protien? Can this be made in a bread maker? Currently in the oven! I can’t wait to try it! I’ve been looking for a yeast bread that didn’t call for vital wheat gluten. We’re trying to stay gluten free! I was wondering, does this freeze well? Can i sub whey protein for regular protein powder? How do we know that the yeast metabolises *all* the sugar/syrup and there’s none left? And when you add the vinegar, doesn’t that kill if off? I’d be inclined to keep it away from that (acid) as long as possible – maybe add yeast and vinegar separately to the mix? 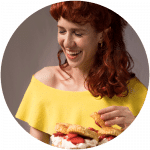 I’m Paola and welcome to gnom-gnom, a true gluten free & keto community for foodies! 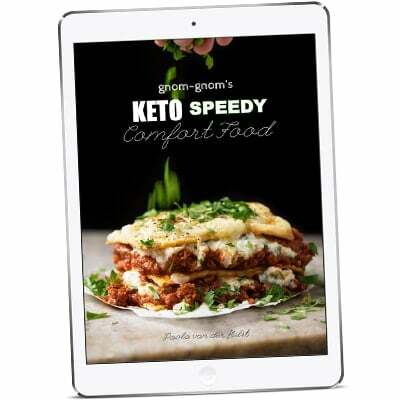 Our Keto eCookbook is here! gnom-gnom is a participant in the Amazon Services LLC Associates Program, an affiliate advertising program designed to provide a means for sites to earn advertising fees by advertising and linking to amazon.com.